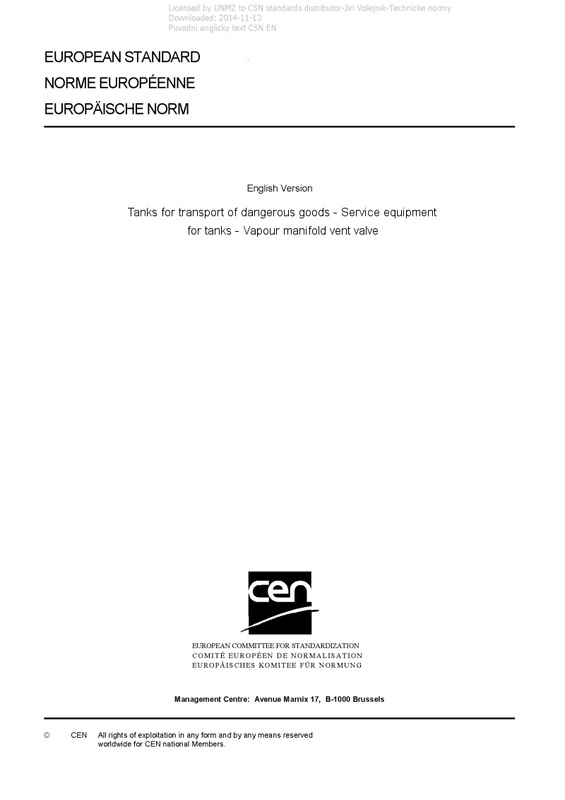 EN 17110 Tanks for transport of dangerous goods - Service equipment for tanks - Vapour manifold vent valve - This document covers the vapour manifold vent valve used to provide controlled venting of the vapour manifold to atmosphere. It specifies the performance requirements and the critical dimensions of the vapour manifold vent valve. It also specifies the tests necessary to verify compliance of the equipment with this document. The service equipment specified by this document is suitable for use with liquid petroleum products and other dangerous substances of Class 3 of ADR  which have a vapour pressure not exceeding 110 kPa at 50 °C and petrol, and which have no sub-classification as toxic or corrosive.